Miley Cyrus and Liam Hemsworth secretly obtained a marriage licence in Williamson County, Tennessee on December 18. The couple shocked fans over Christmas after they confirmed they had tied the knot in an intimate ceremony, with just their family present, and it has now been revealed that they got their marriage license in Williamson County, Tennessee on December 18. Paperwork obtained by TMZ shows the couple went to the office to sign on the dotted line and they now have 30 days to complete the document and return it to the courthouse with officiant's signature on. Miley confirmed her marriage to Liam by sharing a string of black and white photos from their nuptials this week, a decade after they first met while shooting 'The Last Song'. In one set of pictures of the pair embracing, Miley - who wore a floor-length white Vivienne Westwood gown - captioned the Instagram post: "12.23.18"
And alongside another, she wrote: "10 years later .....(sic)"
The couple had planned to wed over the festive season at their Malibu home, but after it was destroyed by the California wildfires last month, they shifted their celebrations to their house in the 'Nothing Breaks Like a Heart' singer's home state of Tennessee instead and had a "perfect" day. A source said: "They always wanted a small, private celebration with family and close friends and that's what they got. Miley seems ecstatic. She loves her Tennessee home and was very happy about having the ceremony there. 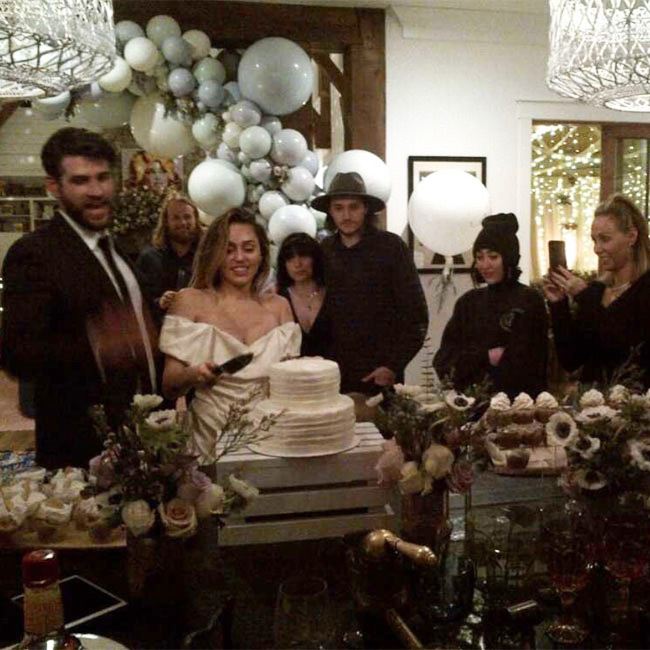 Miley Cyrus has shared a number of photos from her wedding to Liam Hemsworth on her social media accounts. The 'Wrecking Ball' hitmaker has shared a number of black and white photos from her intimate nuptials with the 28-year-old actor on her Instagram and Twitter accounts, revealing they tied the knot on December 23, a decade after they first met while shooting 'The Last Song'. The 'Party in the USA' hitmaker also shared a video of herself and her husband dancing to her friend and collaborator Mark Ronson's song 'Uptown Funk' on her Instagram story. Miley tagged the producer in the post, and the short clip featured Liam filming his wife in her wedding dress as she lip synced and danced to the track, before he turned the camera and joined in." Mark also made a special video for the newlyweds, which he shared on Instagram. He captioned the clip: "Special here comes the bride cyrus/hemsworth remix for 2019. congratulations u two xo (sic)"
The couple had reportedly originally planned to wed over the festive season at their Malibu home, but after it was destroyed by the California wildfires last month, they shifted their celebrations to their house in the 'Nothing Breaks Like a Heart' singer's home state of Tennessee instead and had a "perfect" day. A source told People magazine: "They always wanted a small, private celebration with family and close friends and that's what they got. Miley seems ecstatic. "She loves her Tennessee home and was very happy about having the ceremony there." Among the guests at the wedding were the couple's siblings Noah and Brandi Cyrus and Chris and Luke Hemsworth.